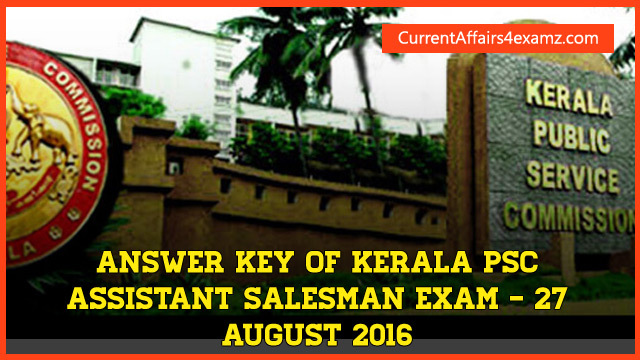 Hi Aspirants, Kerala PSC today's (27/08/2016) conducted the Assistant Salesman Exam for Kerala State Civil Supplies Corporation. In this post we will be bringing you the Question Paper and Answer Key of this exam. More than 4 lakh candidates have appeared for the examination across Kerala. 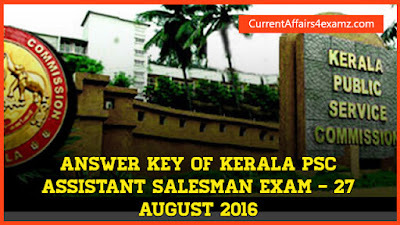 Official Answer Key will be published by Kerala PSC within 1 week. 1. Karthik speaks English fluently,..........? 7. Elephant is the......... animal on land. 8. Success and......... are two sides of a coin. 16. I prefer chocolates....... nuts. 17.Yesterday l met...... old man. 18. One of the man....... attended the meetting. 19. Rahul usually....... newspaper in the morning. 69 A I have got a headache.